MSF doctors suspended their work in the DRC after militia attacked two Ebola treatment centers. The incidents show how dangerous it is to try to stop the deadly virus at the epicenter of a political conflict. 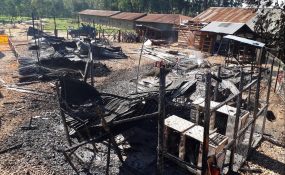 MSF Emergency Desk Manager, Hugues Robert, said in a statement that the organization had no choice but to suspend its activities "until further notice." "This attack has put not only the lives of Ebola patients and their families in danger, but also those of MSF and Ministry of Health staff. Our efforts are currently focused on the immediate safety of both staff and patients," Robert said. "There is a large part of the population that is very reluctant and not convinced that [the] Ebola disease is really present," Emmanuel Massart, MSF's field coordinator in Katwa told DW. "This means that patients who are infected with Ebola are often hidden in the community. Even with the best treatment health center in the world, if patients don't get to us in time, there is not much we can do." Butembo Mayor Sylvain Kanyamanda meanwhile pleaded with the community to assist authorities in the wake of the attacks. "Every normal person would seek to avoid death. So we call upon the population to help us find or denounce those who have fled from the center and continue to hide in their homes. Because they are a very serious threat of contamination," Kanyamanda said. DRC Health Minister Oly Ilunga Kalenga condemned the attacks. "It is our responsibility -- we the people who are benefiting from the service to make sure that the team and the people fighting against Ebola are safe. It is society's responsibility. What we are experiencing here is the contrary," he said. The militias who rarely speak publicly have failed to heed calls from community leaders and priests in the affected areas to permit Ebola health care workers to carry out their work. UN agencies operating alongside Health Ministry staff need the assistance of soldiers and police, while international NGOs employ security guards to secure their facilities and staff. When the Kivu Ebola outbreak was confirmed in August 2018, the World Health Organization and international groups warned they would be working in conditions that were "very high risk" due to the political instability in the region. In addition to MSF, the WHO and other UN agencies, humanitarian aid groups such as Caritas, Medair, Mercy Corps, Samaritan's Purse, Save the Children, and the Alliance for International Medical Action (ALIMA) provide services in the North Kivu areas of Katwa, Butembo and Beni. There have reportedly been cases where Ebola aid staff have refused to carry out their duties out of fear for their personal safety. The UN has repeatedly warned that the instability in North Kivu puts the humanitarian response at risk. International charities rely heavily on information about the daily risk on the ground from the UN Office for the Coordination of Humanitarian Affairs. One international nurse who is working for a US non-governmental organization in North Kivu told DW about the rising fear among health workers in the area in the wake of the attacks. The nurse, a citizen of Congo himself, declined to be named as he is not authorized to speak to the media. "When you are working in the Ebola context here, you are in permanent insecurity. You can be killed instantly," he said. "The problem is that when you are on the ground for another project you are confused with the Ebola workers and intimidated. When I am in the field, people cry behind us 'Ebola, Ebolaaa' - and there all can happen to you." "It is so hard, I can tell you. They are killing nurses and all who are working in the Ebola situation in villages and centers. It's my job, I did it internationally in emergencies in Rwanda, Chad, South Sudan, Bangladesh and Burundi -- but at home it seems very complicated."